Having such a capability gives the freedom to public or private sector organisations to develop an ethos of entrepreneurship and the ability to experiment with different choices. Market responsiveness, changing technologies and trends, tighter budgets and shifting economic conditions have all acted as stimuli for organisations to innovate to consider alternative approaches to drive performance. Innovation happens not only in a product or a service but also in the way in which organisations design and conduct their business to maintain competitive positioning. The drive for innovation requires openness to collaborate and the freedom to be creative. However, organisational rigidity and bureaucracy often inhibit the innovation process. Having a structured approach that contains risk whilst providing a channel to experiment out of the business norms, provide greater opportunity to secure quick wins. One structured approach is the formation of an Innovation Hub. An Innovation Hub presents a compelling platform for harnessing capability, focusing investment and stimulating enterprise. The key to successful innovation hub development is to cluster the organisation’s capability around new and emerging economic areas of growth. Clustering delivers constructive alignment between a business strategy and the innovation focus, thus improving speed of response and enhancing the quality of new offerings for the organisation. Innovation hubs can be physical or virtual and their structure and characteristics are determined by strategic goals. They can be implemented at a regional or city level, or as part of a company, a college or a public sector organisation to provide the vital knowledge exchange environment that stimulates creativity and accelerates innovation. Hubs can be formed as an autonomous single unit or as a network of distributed but interconnected thematic entities. In education, innovation hubs offer a natural fit with further education colleges in that they build upon the relationship that a college has with local business and industry, and provide a means of collaborative engagement to develop commercial solutions, underpin educational provision and extend outreach and civic activities. Examples of innovation hubs in education include Tyne Metropolitan College who focused on providing solutions in Engineering Systems and Design, Havering College built their Hub on the strength of their healthcare expertise and Plymouth University centred their Innovation Hubs on developing local enterprise capital in eco-environment, health and life sciences and digital and media creative sectors. In business, innovation hubs can be used to leverage broad base IP and identify possible solutions to challenges, thereby enabling faster market response. Pharmaceutical and FMCG businesses often use the notion of open innovation delivered through innovation hubs to access different expert perspectives to support creative problem-solving. An example of an Innovation Hub approach in business has been the collaborative laboratory or ‘Collaboratory’ in DuPont. Both virtual and physical, the Collaboratory which brings a knowledge base of some nine thousand experts in the fields of science, engineering and technology, is founded on the precepts of collaboration and co-creation. Through the use of live conferencing, design thinking and ideation, solutions to challenges are being discovered and DuPont’s innovation pipeline is flowing. In addition, there is a direct correlation between development of a hub and the increase in the level of learning development. Such activities lead to instilling a high performing culture that strengthens the organisation’s readiness to innovation and builds its knowledge base. 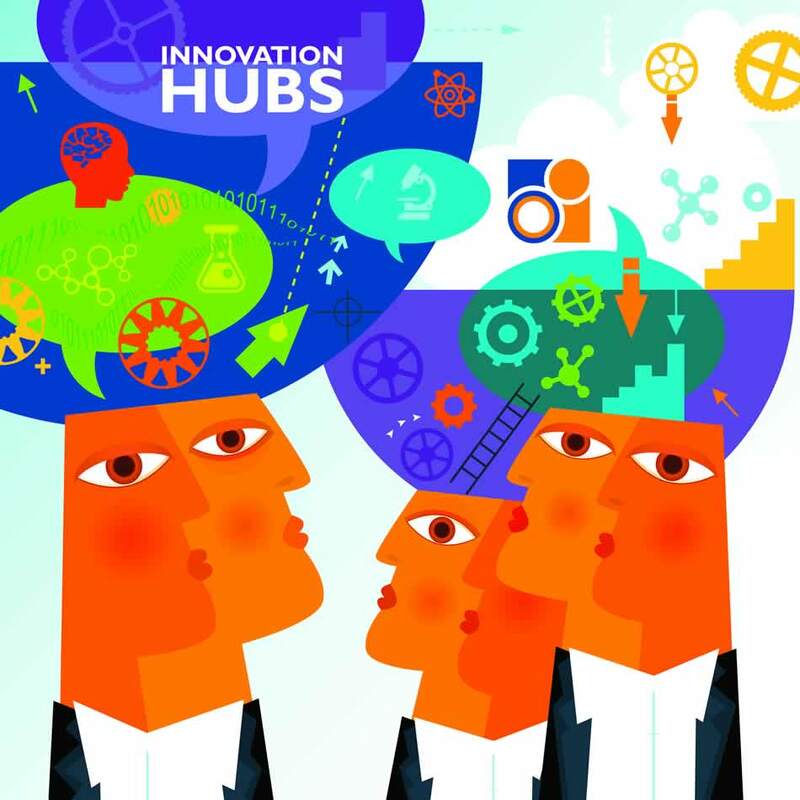 Organisations who create innovation hubs have the ability to mobilise innovation initiatives quickly and can optimise the time taken to create new value for their end users and themselves. Hubs provide an effective vehicle for shaping the dynamics of go-to-market solutions. Their primary focus on innovation, make the measurement of their tangible and intangible outcomes more readily identifiable. However, the key to success for innovation hubs is the ability of organisational leaders embarking upon such development, to take on both a governing and an empowering role. Whilst maintaining a future focus on managing an innovation portfolio, a hub leader should also embrace impact-driven operational accountability that fosters partnership development to drive co-creation and informs the decision-making processes within a hub’s ecosystem. Different investment models in innovation hubs could be considered. The simplest is to provide a separate budget for hub development with its own P&L. However, this approach may not necessarily render the best returns. Alternatively, adopting a partnership model for investment with stakeholders (e.g. supply chain, customers), could potentially extend the opportunities and benefits. In fact, hubs provide a robust mechanism for competitive collaboration. Again, pharma companies tend to do this well in tackling issues during drug development or a clinical trial stage. Such models can offer a scaffold structure for any sector to consider. A third option for investment in hubs could be the employ of an aggregator concept, where the participation of many stakeholders, particularly small and medium size enterprises is encouraged. Universities and college could adopt such a model as it naturally lends itself to a wider collaborative innovation development.